Another cleaning day in great weather. It was a really lovely day yesterday, so first thing we did was putting the bunny outside in the late morning. And oh miracle, Brodski had the courage to put his nose against the gitter of the bunny cage! First time I saw him do that. But poor cat, bunny was all excited to see a cat again, he thought to have a playmate and enthousiaticaly offered the cat his ball with a little bell in it and jumped up and down of joy. Well, that was too much for Brodski so with a jump and run he save his "skin"LOL! And we did some great work yesterday. I took the curtains from the back of the house and gave them a good wash(by hand), then I planned to clean the windows, but my sweet husband offered to do it, nice hmmmm? So I went to the kitchen, took the little curtains there and washed them and cleaned the windows and the woodwork around it too. Pffffff, all together it is heavy work, but the result is great. Then also gave a good sweep in the house with the vacuum cleaner and prepared also the meat for our dinner and then thought it was enough for that day LOL! But today I have to do a bit of shopping and turn on the washing machine, not too much. It doesn;t look to be such a good day as yesterday, but they promised us much better weather next week, so may be the summer will return in August. Didn't do really much on the designing, I hope to do something during the weekend. 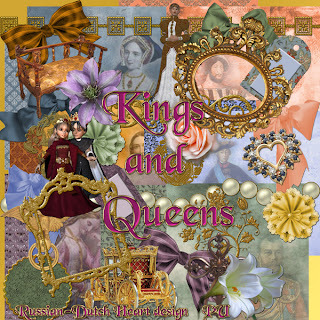 Still I have two sneak peeks fro you of kits, oming up in August. I like to puzzle you a bit! And on to today's freebie. 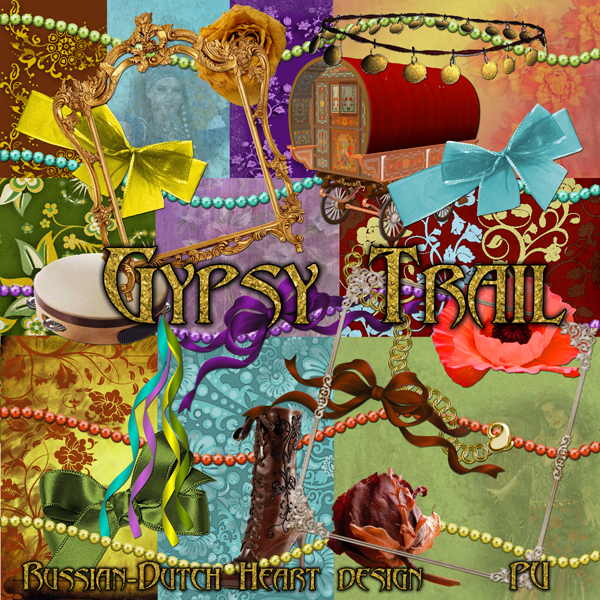 We go for a bit of temperament with the kit "Gypsy Trail". Atill early now, but I think I like to have a coffee now and then up to the supermarket! Have a fantastic weekend and see you back, I hope, on Monday! At the moment clouds are hiding the sun, the last couple of days we had some on and off rain, but temps are slowly going up again and they say in a few days it might be dry all days, and there also will be some sun again. May be we'll have a summer like month of August. The hard work is not really cleaning those little windows, but moving around all the time the stairs. And it's not easy to move that around in a bit marrow hallway. But I am proud of myself and it's a real difference now, specially with the light that can come in through clean windows LOL! Now I hope one of these days weather will be nice enough to open the garden doors again and when that happens, next task is to tackle the windows and woodwork and wash the curtains and let them dry a bit in the sun till they are not dripping anymore and they can dry as I put them back again. They almost don;t wrinkle when you hang them still a bit wet. So as you may guess, I am feeling much better every week, although condition is still not too great. But with some work done every day, or every two days, it should come back too. Just have to divide the things I have or want to do a bit more but I don;t mind, as long as they're done, tadaaaa! I really hope the next days there will be more sun, because for one, it's nice and makes you feel better but second, the tomatoes of Jan need definately some sun to get a nice red colour ROFL. He is worried a bit, that they will not mature in time! He still is hunting snails almost every day, cause he does't like them to eat several plants. But he likes them too, they are in fact beautiful little creatures, he says, funny in a way too. I have a strange man, don't I???????? Okay, enough rambling, I think it is freebie time. A summer kit this time, named "Garden Corners to Relax". 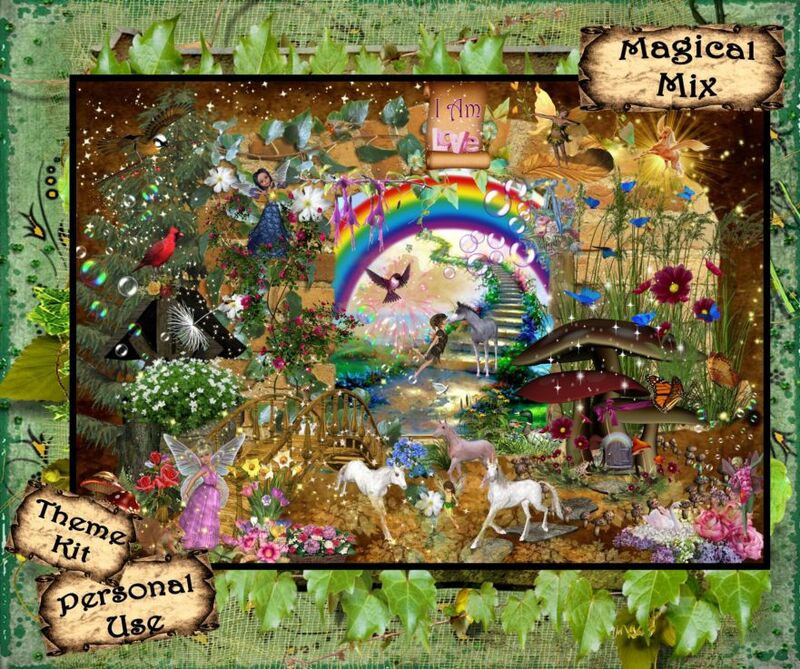 Make some beautiful things with it and have a marvellous day! In fact, it will not be a good morning to everybody. I suppose you all heard the terrible news this weekend of the shooting and bombing incidents in Norway??? Over 80 people died, just because a really crazy person thought he had to "save"his country from some undesired people(this in |HIS opinion!) I don't denie to anybody to have his or her own opinion and thoughts, but then to freely take a bomb and let it explode and then go to an island and start shooting around is completely out of order! The guy already confessed his actions and even started to explain why!! I hope, they put him in prison for the rest of his life! My thoughts are with the Norwegian people in this hard time. So you understand, I didn't go out, only on Saturday morning, when it still was dry, to buy a newspaper and some strawberries. But, this weather was a good excuse to do some more at the computer, although I also did the ironing yesterday. 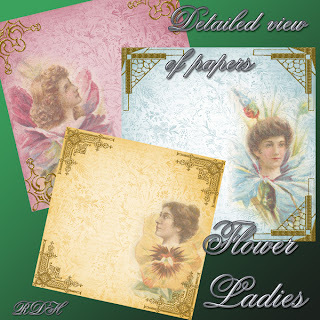 And I told you I downloaded a lovely freebie at Aussie Scraps, and I made some things with it. 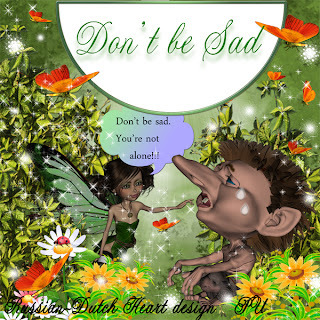 Probably you noticed I changed my bloglayout again, and be honest, don;t those trolls look sweet???? 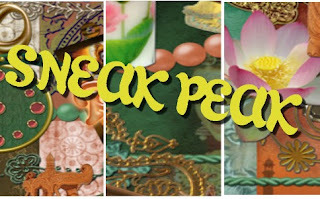 Just before I started posting, I went to my friend Edna's blog, for catch up and she made me laugh, again. I just love her way of writing and the humour in it. And I have the feeling she things I know may be not ALL, but a lot about plants, because she put two pictures on her blog of a shrub in her garden (a lovely shrub by the way) and thought I might know the name of it. Well, my guess is, that's a Viburnum, perhaps somebody could also take a look and might come to rescue, if I was wrong???? Slowly it's getting time to put on some clothes and do a bit of housekeeping again, sigh! Oh, I did a lot on Friday, but there are always new things waiting for you, how exciting, hmmmm?? 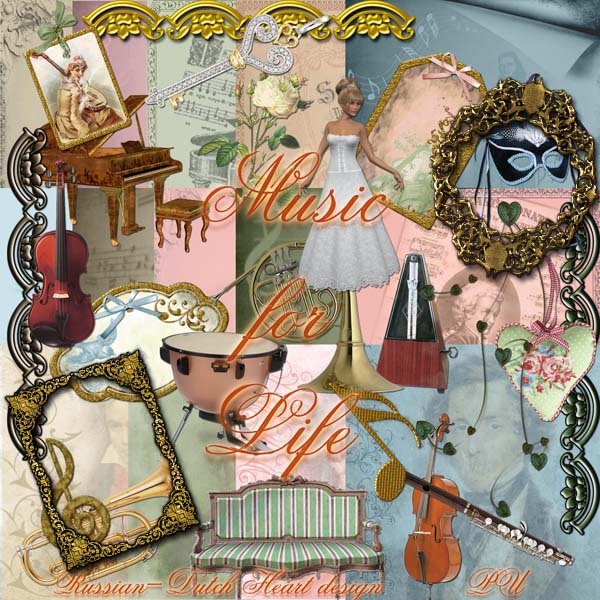 Today I have a kit for music lovers, perhaps. Named it "Music for Life" and hope somebody can do some nice things with it. Yeah, we did make it to the market on Wednesday. It was delicious weather, so we chose a good day. We didn;t stay too long there, it was rather crowded, and Jan doesn;t like that too much LOL. I could have spent a bit more time there, but perhaps one of these days I will go alone. Still, we got home with a filled shopping car, ha collie flower, some leak, a white cabbige, two melons, onions, potatoes, mandarins, bananas, paprika, some fresh parsil and dille, garlic, so when we came home I started right away preparing the vegiies for the freezer. You know, cutting all up, give it a real short cooking, and when cooled down, I could put it all in little bags. Oh, on the way home I also bought some chicken breasts and chicken liver, so the freezer is quite well filled again. LOL. Yesterday I took it a bit easeir, but did change the bedsheets, always nice to go to sleep when they have been changed, isn;t it? Poor bunny didn;t have some playing time yesterday, but today weather looks good enough to put him in his play-cage in the garden. I also managed to finish up a kit I was working on, and you know what????? I have a little sneak peek for you. Up to you to figure out what kind of kit it will be! 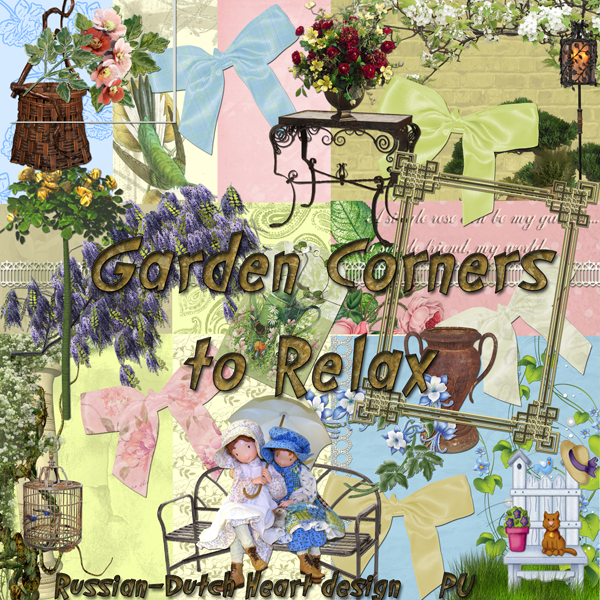 I also spent some time this morning catching up on some blogs, and I run into a lovely freebie from Gail, from Aussie Scraps. 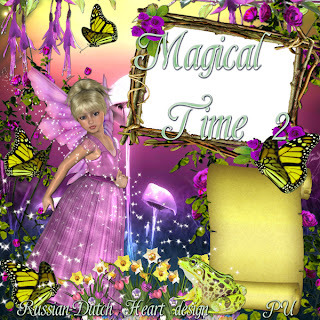 Take a look at her blog, it's a lovely freebie and I am sure I will be playing with it this weekend! 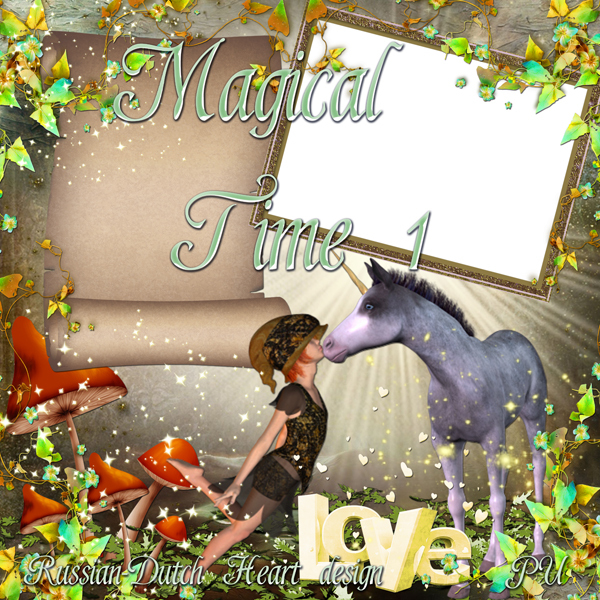 Then also Minky has a new freebie on the Creative blog, so take a look there too! I will have a lot to do this weekend LOL! 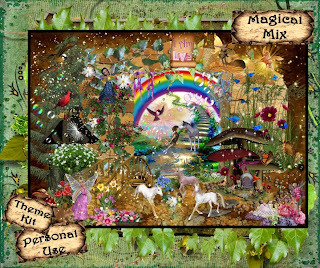 But first I must do a few things around here, and then perhaps later today I can start playing around in PSE8. But there is also something on tv, meaning I will have lots to do. ROFL! This afternoon there is a heavy and difficult day i the Tour de France, one of the biggest cycling events in the year, yes we do follow that too a bit and this evening I will amuse myself watching the show Holland got's talent. This all meaning I must get moving around here and actually start DOING some thing( does vacuum cleaner sounds familiair to you???). 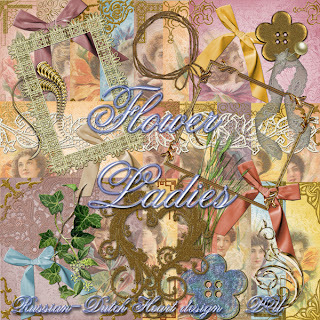 I have the last part of the Flower Ladies for you and Monday a new kit, not the one from the sneak peek, yet another one! Oh yeah, I am busy again designing. You all have a fantastic weekend with lots of fun and creatice energies! Even though Monday didn;t look too bright outside, I did go out and found the temperature quite nice! It was only a pity that there were sudden rainshowers throughout the day and of course on my way back home I got one on the head LOL! I managed to get home relatively dry, so it wasn;t too bad. But it was a "bad"day for the bunny, he had to play inside. Yesterday it was real gorgeous weather, although there was some rain-threatening, but there didn't fell a drop! So bunny could play in his outside cage and Jan and I did make a visit to Heidi's house. Danny's parents are watching their house an feeding the fish, but we needed some stuff for bunny's cage, so went to get it. I promised Heidi that I would take care of the garden, but as enough rain fell the last week, there was no need for me to go there earlier and when I took a quick look yesterday, all was fine with it. Now today it looks as if the weather will be as nice as yesterday, so Jan and I will take a walk to the market, and hopefully return with a lot of vegetables and fruit and may be even some fish and if we return with enough vegetables, I will have a busy day tomorrow, preparing them for the freezer. 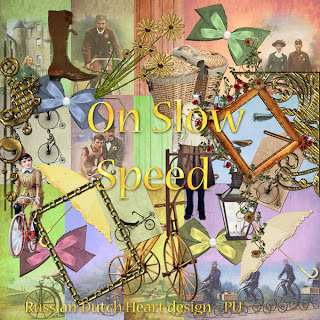 under the header of "Scrapbookkits"
Well, you can understand I am a little bit in a hurry, don;t want to go too late there. I am posting the second part of the Flower Ladies. Friday was a bit of "working"day, hahaha! I did some shopping and when I was home again, did some hoovering and dusting and a few little jobs. Even the weather wasn't too bad, and in the evening I watched the start of a new series of "Holland Got Talent". You much watch that program with a blank and open mind, but then you can have fun! Unbelievable, what you see and hear. Some things are really aweful, but always some surpprises are there too! Saw a few very good acts, and good singers too! Saturday was a nice day and I found the trick for the bunny to keep him busy! We sat up the large cage in the room on a big plastic, so all his "surprises" are easy to clean up. But it's still not the best underground to receive his liquid surprise(ROFL), so I spread a few pages of a newspaper on it. And how happy the bunny was with that! Right away he started to examine the paper and whee, had a terrible good time tearing it up for a part. At least he looses some energy doing that and you could tell he had a busy afternoon, cause in the evening, back in his normal cage, he was very, very quiet! The poor thing was almost exhausted! So as it is a rainy day again today, he'll have some fun this afternoon again! I chopped two spring onions( but you can take also a regular onion, fo course), chopped some garlic, in the mean time cooked a handful of rice. Then took some minced beaf, threw in the onion, garlic, an egg, parsil, pepper, salt, a bit of grated parmezxan cheese and mixed it well. In an oven tray I poured just a thin layer of olive oil with some chopped garlic in it. Then cut the "roof"of the paprika's, took out the seeds and then stuffed them with the minced meat and out the "roof"back on to it. When it was almost time for dinner I pre-heated the oven on around 190 degrees C, and then put in the tray, for about 40 minutes. Boiled some potatoes and we had a delicious dinner! It also goes well with mashed potatoes, rice or pasta. In the evening we watched the final of the WOMEN SOCCER CHAMPIONSHIP! And what a great evening we had! It was a real exciting match between................USA and Japan! And if you never have watched a women soccer game, you should! This is what a soccer game should be. Okay, may be they are not making every pass just right, but in general they all play fair, there is action all the match through, you must admire and respect their dedication and energy, a lot of MEN footballteams could learn a great deal of them, on how a soccer game should look like, not like some matches we see, that there are almost life threating attacks on players, real unsportive behaviour and at times real bouring play! Hoorray for women soccer, and if progress goes as fast as the last few years, it can only grow better. Pfew! 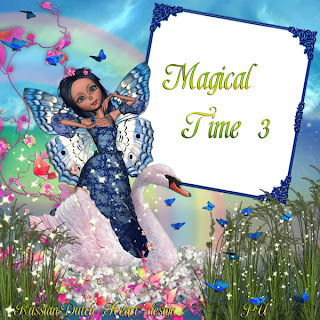 It has become a rather long post, so I better hurry up now, there are still some things to do today! 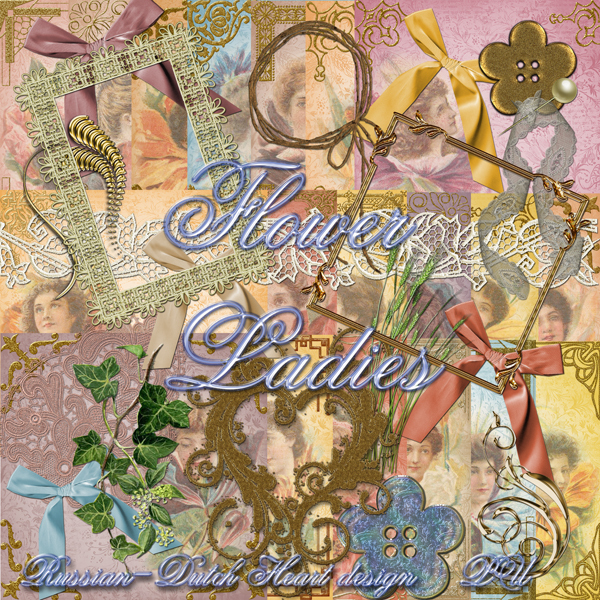 I have this week a kit for you in 3 downloads, it's named Flower Ladies! I have a preview for you, of course, but also a detailed preview of a few of the papers. (There are 21 papers in total!) I think you can make cersatile layouts with this kit. Hope you like it, I made it with great pleasure. My God, yesterday it really looked s if we already had autumn overhere! It rained ALL day( well, almost all day), and there was a lot of water coming down! And as extra "treat"the weather Gods threw in a stormy wind! I think temperature didn;t come higher than around 57 F!! It was NO fun at all, a dark and grey day, it made you wish to stay in bed. Okay, I didn;t do that, but I wasn't very energetic, abd didn;t do too much around here. Now today it looks much friendlier, even some sunshine, still rather windy, but less than yesterday, so I suppose I can go out in it without having to carrie a couple of bricks in my pocket, LOL! I'll have to do some grocerie shopping today and I must not forget to buy some treats for our bunny and bird guests, and food for the cats. It still is a disaster with the cats! Especially Brodski is feeling himself so pityfull! He refuses to enter the room, cause he has to pass the bunny cage then. He however found a solution, he installs himself on the bed at the moment. Well, perhaps not the best thing to let go, but we let him for now. Specially with the weather like yesterday. I didn't go look into the garden yet, but I surely hope the wind hasn't damaged too much! The good thing is, that we have a bit of sheltered garden, concerning the regular wind direction. I suppose the only ones that had a good time, were the snails. So another little job to do today! I won't bother you too long with my rambling, I want to do my shopping a bit early and then tackle later the house a bit. Still no idea what we shall eat this eveniing. Fridays and Saturdays we mostly do it "easy", meaning I don;t really cook. Perhaps I can get some grilled spareribs, then I only will have to warm them up in the oven. 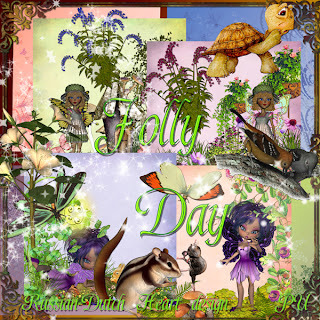 Today I have a little kit for you "Jolly Day". Have fun with it. Looking outside I must say it's a diffenrence of night and day with the weather! Yesterday morning it all was bright and sunny with good temperature, but during the afternoon it already started to change and in the evening it started raining. And it still is, and I am sure temperature dropped at least 5 degrees if not more! Nature will be happy with it, but I surely hope it will change again fr the better during this week. I think today will be a good time to do a bit of ironing, there isn't too much stuff to do, so it will be done quickly. And I even can tackle some other things. I had a kind of "black-out"concerning the dinner yesterday. Just couldn;t come up with an idea. everything that came into my mind was rejected at the same time, nothing seemed to be of the "yes, that will taste good" kind. But then I found something. I just made a big omelet, filled with little squares of potatoe, mushrooms, some bacon, spring onion, and little shrimps. Wow it was a nourishing meal, with some strawberries and cream as desert! Today we will have a "regular"meal again, no problem. It will be a veal saucage, with boiled potatoes and fresh stir fried spinach. Quick, easy and even a bit healthy(well, at least the spinach LOL!. 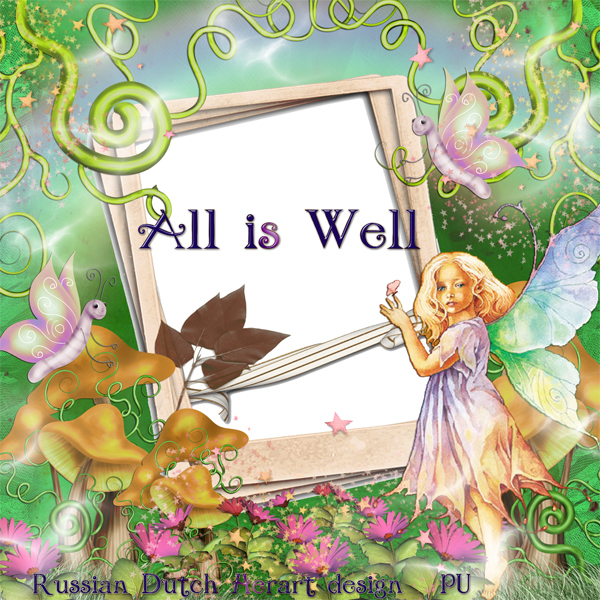 That's about all to tell, not much I know, but not every day can be filled with adventures and events, at least not of the kind worth putting in a blog post ROFL. 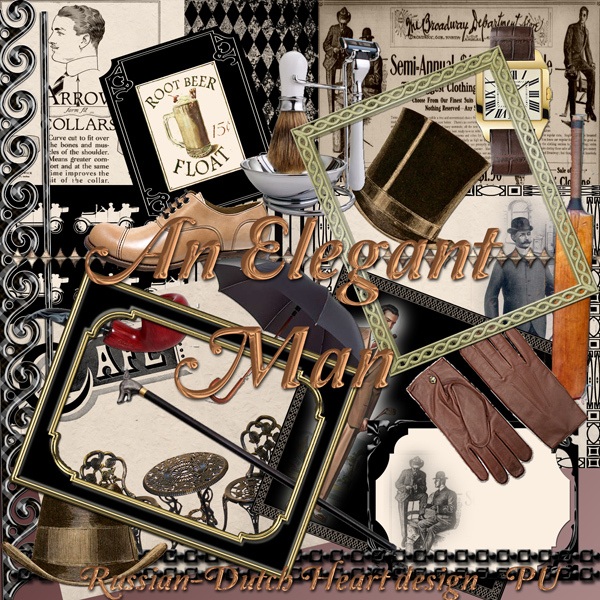 Today I have a kit that will do nicely if you want to scrap some pictures of men. It's named"An Elegant Man". The PET HOLIDAY HOTEL IS OPEN lol! It has been a nice, easy, relaxing weekend, I don't mind having that kind of days! The "pet-holiday-hotel" has opened it's doors yesterday. Early afternoon Danny, Heidi and Séverine came to bring the bird and bunny, with all the stuff as food an straw etc. We had a little chat, which was nice and then they left again. They will go on their holiday tomorrow in the evening, Danny likes it better to drive at night, he says it's much more relaxing and not so crowded too on the roads. So when they had left, we thought it might be nice to put the bunny in the garden. Not running around freely, cause he can escape to other gardens, but Heidi brought with her a kind of large cage you can put up for the bunny. So we set it up and released the bunny into it. It's bigger than his daily cage, so the poor thing can run a bit around. Oh, he was quite happy with it, nicely in the shade, being able to sniff some fresh air and even touch noses with our Dikkie Dik! He likes it from time to time to take a look at that funny animal and after a few minutes it's enough for him. But the stupid Brodski doesn;t like the bunny at all! From distance he looks with a suspicious eye at it, and he is in NO hurry at all to enter the room at the room! The bunny is close to the door, so when Brodski wants to pay us a visit he has to pass the cage with the bunny! And it seems to frighten him a bit LOL! I think this will pass after a few days, but if not he will have some hard weeks ahead, ROFL!! Heidi and Danny will be away for about 4 weeks, so the birdie and bunny will have some awesome weeks, hahahahah. They will be pampered a bit, I am sure, and the cats will feel a bit neglected, in their opinion, and Jan will do most of the work, like cleaning the cages, feeding the "guests" etc. Weather looks nice again today, so I will take advantage of that bu doing some shopping today, and perhaps turn on the washing machine. Friday I did a good cleaning of the bathroom/toilet, hoovered the house, dusted the room, well, the always returning things you'll have to do, and yeah, Jan washed the outside of the front windows, which is quit a difference. You can really look "through"them LOL! I have a funny litttle kit for you today, nemd "Mousing Around". Have some fun with it! And as it is still early, I can play a bit in my PSE, before I have to move around, I think that is a good plan! It has probably to do with the season(time for summer holiday), but in this time of year it's a bit hard to find something nice to watch on tv! On some days there really isn;t one interesting thing to find! Hoorray for video and dvd, we register on other evenings series or programs(can you believe it, that on some evenings there are things you like to see on almost every channel, almost at the same time!!) when the offer is spectacular, so that we have something to watch on the "low"evenings. This evening it will mostly be dvd time, cause you can almost weep looking at the programs that are on this evening ! The check-up with the doctor was okay. I told him I was very happy with the new inhalor, he checked my wieght and yippee, I gained again a tiny little bit. Must have been caused by all that strawberries with whipped cream ROFL. So for now I don;t have to come back to him, let's hope it will be for a LONG time! Now just have to watch the weight myself, so must keep up with eating and let's hope the rest will stay steady, then I will be allright in some time again. Don;t want to fall back again!!!!! Yesterday Jan went for his daily walk and when he came home he had a little plastic bag with him with two cutlings in it. After a few seconds of hard thinking LOL I guessed right that he met Heidi. And so it was. He run in to her, when she was walking her doggie, so she invited him for a drink and gave him the cutlings for me. I was very happy with it, one of them is a Hosta, and I like those plants a lot, they make great accents in the border, but they don;t do it very well ( mostly caused by the snails, it's one of their favourite dishes!). But I will try to grow this one in a pot(they also do great in pots) and then I can keep more eye to it. Cross your fingers that this cutling will do well. Time now to put on some clothes and get a few things done around here, but first the freebie of course. 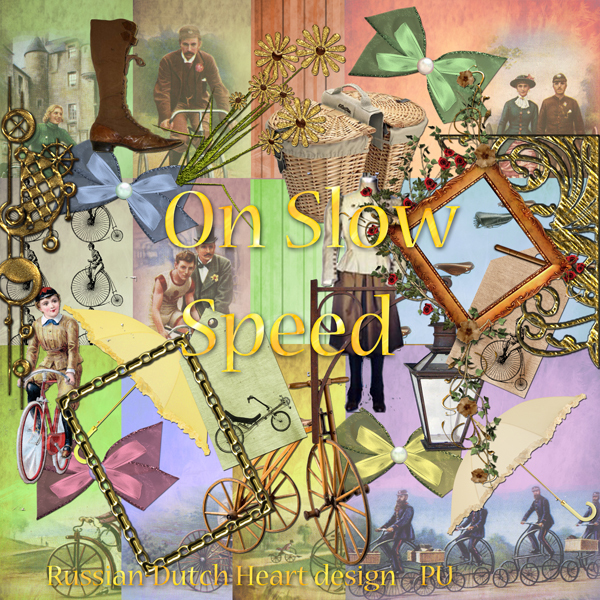 This time I have a kit with the theme "Bicyle", named it On Slow Speed". Now you all enjoy your weekend, see you again on Monday! No garden centre yet, I think. I will try to do a rather quick post, cause I have an early appointment with my doctor. It's for a check up, he wants to know how I am doing. I can say, much better already, mainly thanks to the new inhaler I am using. It makes a huge difference. Now I still have to work a bit on my condition, which isn't good enough in my opinion, but let's be happy with every imporvement, yeah!!! Got a phonecall from \heidi yesterday, that it probably will not happen this week, the garden centre visit. They had some trouble with their car, so it's in the garage for the moment. And already somewhere beginning next week they will go on holiday. It's a pity, we cannot have our garencentre visit yet, but we will go when she's back from holiday. Anyway today it wouldn;t have been a good day, weather doesn;t look too bright, it's windy and grey, may be even some rain will come down. Being not too great weather at the moment I suppose it will be a good day to tackle the shower/toilet today, it needs some cleaning. I will start on it when I come back from the doctor. And who knows, may be this afternoon the weather will clear up and we will see a bit of sunshine. If so, I will take opportunity to finish my book. You should go to my friend Edna's blog, she has a lovely new kit for you, this week is 1st download. Leave a little thanks if you download, all of us love to read a little message in our comment boxes. Though the weather is a bit unpredictable at the moment, in our part of Holland we are the lucky ones, with the most of the sunshine and not much rain. So in all it was a nice weekend. Yesterday afternoon we were at Heidi and danny's home to wish Danny a happy birthday. It was such nice weather we could sit in their garden. It was nice to see them again and have a little chat. There is a little change in the pet baby sitting we will do for them during their holiday. We will only have the rabbit and the bird. The goldfish stays at home, because Danny bought a very small aquarim, with a few other fish in it too, so the goldfish isn;t lonely anymore. Now his parents, who live also close by, will take care of the fish. I also sent away a little letter to Séverine to the scouting camp, told her mother about it and she was very happy to hear it and she told me, that a lot of people sent her a card or little letter, so whe will have today or tomorrow a lot of post! I thought I lost this Malva, but suddenly it came up again and blooms great! And another even darker, aren;t they great? We also had a few strawberries, we need more plants to have a serious crop, but they taste real sweet. Not to compare to the ones you buy at the vegetable store! SOmething to think about for next year! It's time for me to have another coffee and then get busy around here. 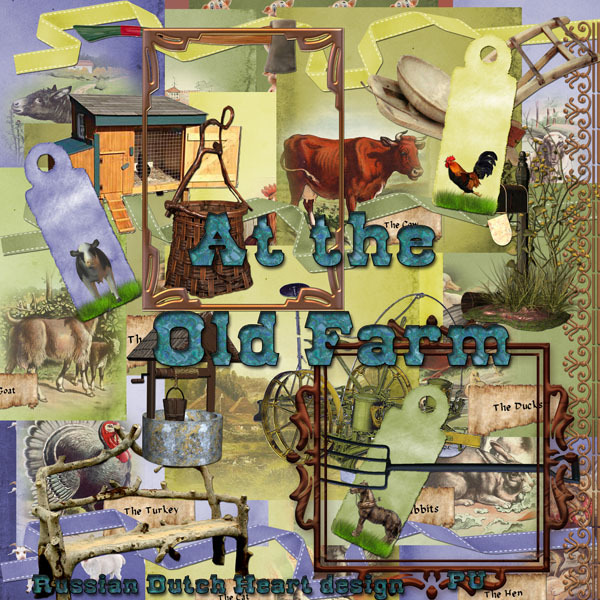 So on to the freebie for today, a sweet little kit named: "at the Old Farm". Have fun with it. 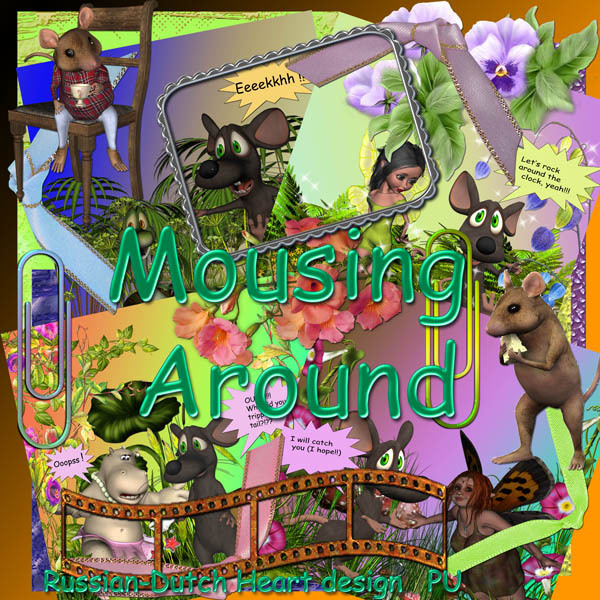 Oh, no, before I leave I will have to give you a link to a sweet blog from Mitzi, who is generously offering a lot of posers for free and she makes real nice ones! Take a moment to visit her blog Mitzi's Harem, you will not be disappointed! I used one of her posers in my blog layout. Have a wonderful day, and happy 4th of July to my American friends!! If Blogger cooperates,I have pictures for you. Even that the weather changed so rapidly, we still cannot complain about it. At least during daytime temperature is nice, although we could do with 2 degrees more over all. Yesterday I took a day of doing nothing, LOL! I found myself another book for just € 4,00, the story takes place around the year 1350 AC in the time that the plague came to England. So yesterday I spent some time in the garden chair, reading, also made the wish list for the garden centre a bit longer and had a lovely day. 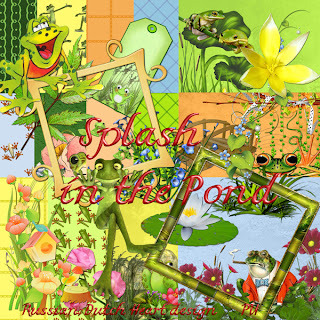 Even made some pictures in my garden, and will show you already some of them. This is the pot with Petunia's, standing on my garden table. Those annuals were really a good buy this year, They flower already for weeks! This is a little plant I thought that disappeared and this year it grows and grows and has lots of these little reddish-pink flowers, great ground cover plant, I know the Latin name of it, not the English one, sorry. It's a species of the Potentilla. And yeah, one of Jan's sunflowers has come to bloom! The green leaves are very badly affected by the snails, but the flower is still gorgeous! And when I saw the picture on the computer, I noticed the little bee, having a great time! Isn;t that cute? And here my lovely hydrangea, coming to bloom! I have more, but I will save them for the next post. 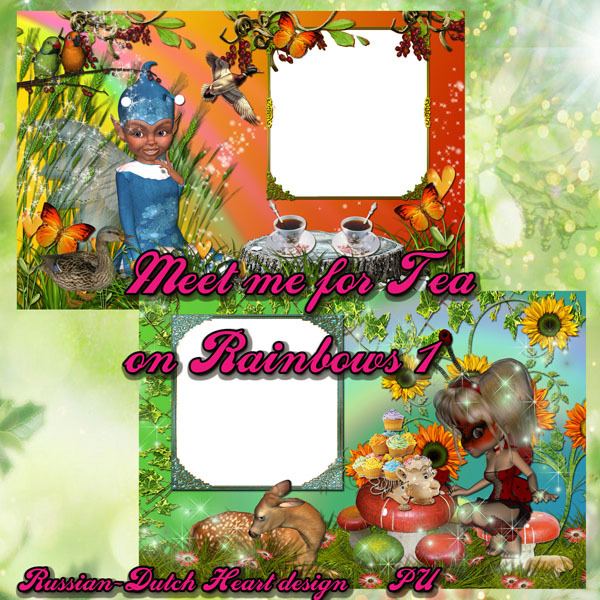 I am still busy on making all kind of kits, and also in between I've made 4 bragbook fantasy pages, you can find them on Minky's blog. These pages were inspired by the text of the mails we send eachother, LOL. Almost every mail we end with: "Meet you on rainbows, for a cup of tea" or "for a little party". !! 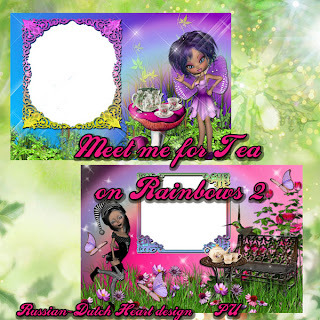 So you will find on all 4 pages a rainbow in the background and tea cups on the foreground. ROFL! Okay, yesterday it was a day of rest, but today I will have to do some shopping and some housework, and may be even change the bed, or I can do that tomorrow. We'll see how quickly all the other things are done. try to write already a little card or letter for her, that I can post this weekend. I will leave you with the second part of Kings and Queens, and wish you all a splendid weekend!